These are two different pieces. 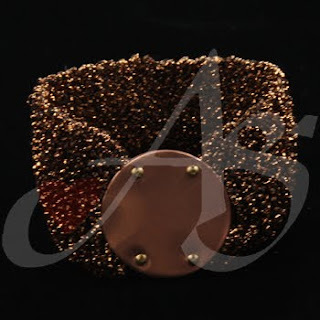 The bracelet is made from brushed aluminium and imprinted copper with brass rivets. All hand cut, sanded and polished with an orginial design toggle. I figured we will show a glimspe of the new work - basically guess the gift all week but with several pieces all at once! Hope I can keep it straight! These are two different items! Hand knitted metallic yarn with double copper disk riveted together. This bracelet cuff is very flexible with a close fit... just beautiful in person! Looks good in the pic too! OCTOBER THE MONTH OF THE ROSARY! 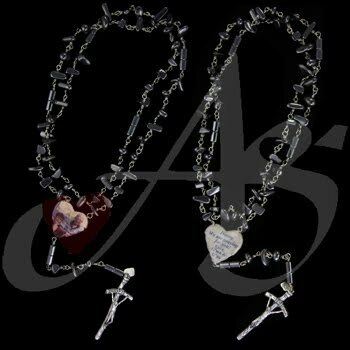 Today’s piece: Another MANLY rosary made of hematite w/ 20g nickel wirework w a Divine Mercy Jesus in the center. This rosary packs the weight and bulk to be used by strong hands building their faith life. This year I made 12 various manly rosaries all sold very quickly. 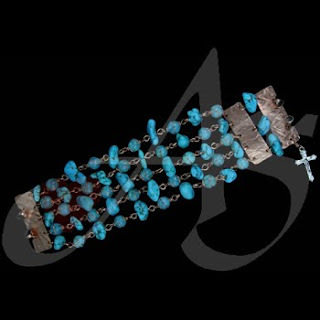 I get positive comments, “there was nothing out there for a man’s rosary until now – love the weight and strength!” This piece is not available. If you would like this piece, a similar piece, or any unique piece of jewelry; contact us! Don't forget to stop by our Facebook page, Google+ page, Twitter, Pinterest, or our website. 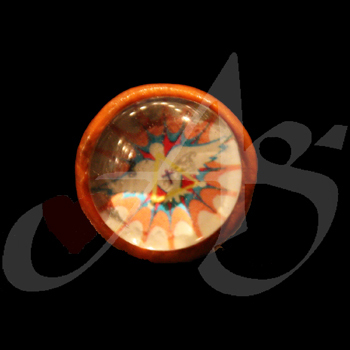 Today’s piece: A spirited tie tack displaying the Holy Spirit – great confirmation gift for the candidate or the sponsor. An artistic way to claim the intercession of the Holy Spirit daily! Congrats to all the newly confirmed! This piece is available. If you would like this piece, a similar piece, or any unique piece of jewelry; contact us! Don't forget to stop by our Facebook page, Google+ page, Twitter, Pinterest, or our website. Carry on solider of Christ! October is the month of the Rosary! Today’s piece: Marian cuff links wearing your faith on your sleeve. 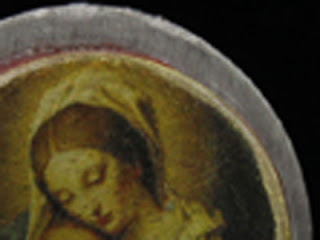 A very subtle soft image of our Blessed Mother in brown tones. 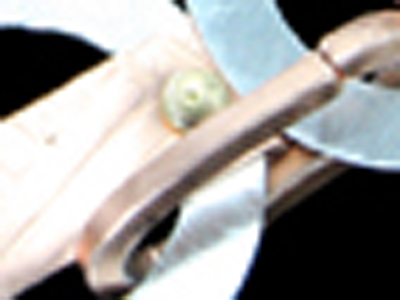 We design both cuff links and our very own created smart links. Great gift for Christmas to encourage the man (men) in your life to carry on strong in their faith journey. This piece is available. If you would like this piece, a similar piece, or any unique piece of jewelry; contact us! Don't forget to stop by our Facebook page, Google+ page, Twitter, Pinterest, or our website. Can you figure out what this is? The material? 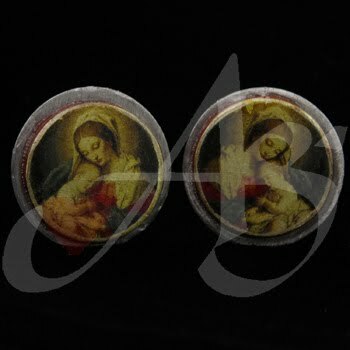 This item is a man's cuff link w/ an image of the Blessed Mother and Child. Two step design giving some dimension to the cuff links. Constructed w hand textured brass with a lacquered image on the top. What a wonderful way to wear your faith on your sleeve! 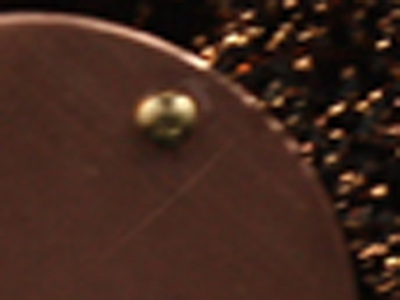 Play Guess the Gift again! If you would like this piece, a similar piece, or any unique piece of jewelry; contact us! Don't forget to stop by our Facebook page, Google+ page, Twitter, Pinterest, or our website. October is the month of the Rosary! Today’s piece: A commemorative MANLY rosary; rosary with weight and bulk via hematite beads and 20g wiring. A great weapon according to St. Dominic. Our new line of manly rosaries have been a huge hit. They were to be fully revealed in November but when sitting on the design table they would be purchased before I could store them for the upcoming show. A cherished rosary via the manly owner. This piece is not available. If you would like this piece, a similar piece, or any unique piece of jewelry; contact us! Don't forget to stop by our Facebook page, Google+ page, Twitter, Pinterest, or our website. In the Name of Jesus - proclaim it! October is the month of the Rosary! Today’s piece: This is a man’s ring praising the name of Jesus! 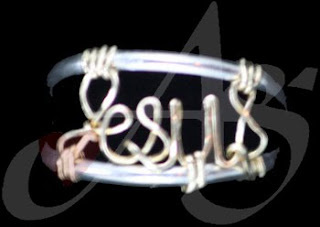 The ring is constructed with heavy sterling silver and gold-filled wire; my hands formed the written name of Jesus. I have actually made this piece smaller for a young girl. This piece is available. If you would like this piece, a similar piece, or any unique piece of jewelry; contact us! Don't forget to stop by our Facebook page, Google+ page, Twitter, Pinterest, or our website. October is the month of the Rosary! 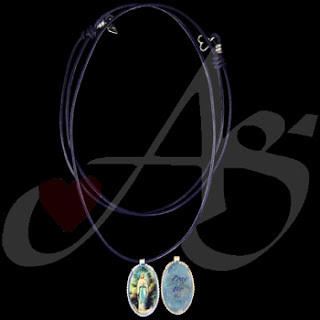 Today’s piece: An Image Our Lady of Lourdes sterling silver hand wire wrapped frame with an accent of adjustable blue leather cording. A daily remember of Mary’s intercession; Mary, pray for us! This piece is not available. If you would like this piece, a similar piece, or any unique piece of jewelry; contact us! Don't forget to stop by our Facebook page, Google+ page, Twitter, Pinterest, or our website. October is the month of the Rosary! Today’s piece: An Image the tree of life in hand wire wrapped frame with an accent of adjustable black cording. 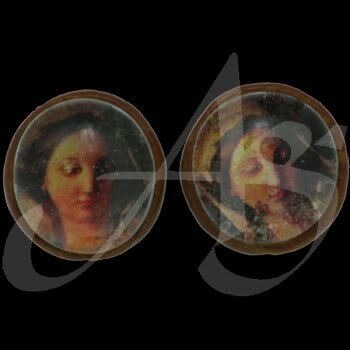 Mary has various names to represent her and she did say YES to the ultimate life!. Mary, pray for us! This piece is not available. If you would like this piece, a similar piece, or any unique piece of jewelry; contact us! Don't forget to stop by our Facebook page, Google+ page, Twitter, Pinterest, or our website. October is the month of the Rosary! 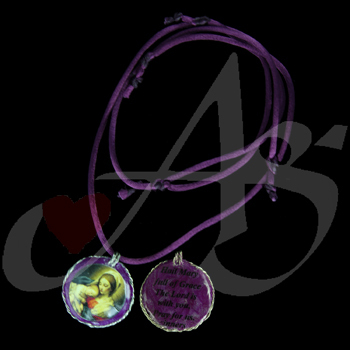 Today’s piece: An Image of our Mother Mary in hand wire wrapped frame with an accent of adjustable purple satin cording: A great piece to wear with beautiful fall colors promoting our Lady and her intercession on our behalf. Mary, pray for us! This piece is available. If you would like this piece, a similar piece, or any unique piece of jewelry; contact us! Don't forget to stop by our Facebook page, Google+ page, Twitter, Pinterest, or our website. October is the month of the Rosary! Today’s piece: An Image of our Blessed Mother in a hand wire wrapped frame with accents of crystals around her face; hanging from adjustable leather strap. A great piece to wear for the fall colors and that quietly wears your faith and invokes evangelizing to the passerby. This piece is not available. If you would like this piece, a similar piece, or any unique piece of jewelry; contact us! Don't forget to stop by our Facebook page, Google+ page, Twitter, Pinterest, or our website. October is the month of the Rosary! Today’s piece: A copper and sterling silver with he;matite and pearls adjustable necklace. 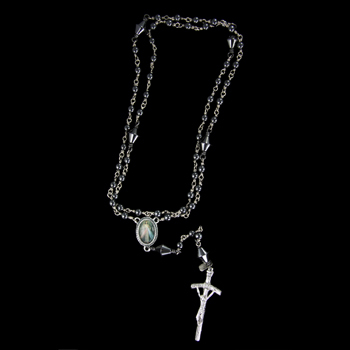 This necklace is not a rosary but goes with the rosary displayed last Friday – they are be worn as a pair. This piece is available. 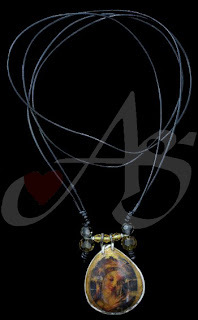 If you would like this piece, a similar piece, or any unique piece of jewelry; contact us! Don't forget to stop by our Facebook page, Google+ page, Twitter, Pinterest, or our website. October is the month of the Rosary! Today’s piece: A sterling silver & gold-filled hand wired rosary bracelet accented with beautiful garnet stones. 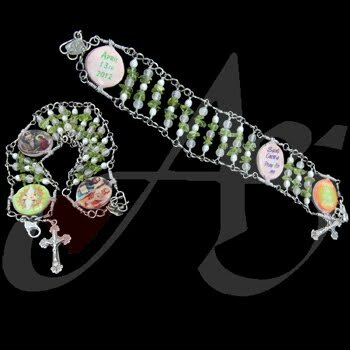 This rosary bracelet has fun dangles and wire work of a dainty whimsical bracelet. 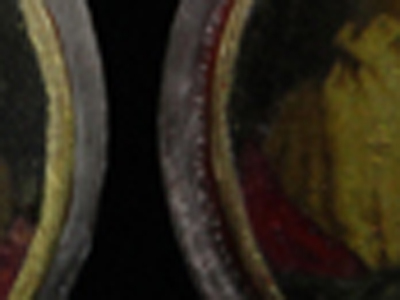 I like the interplay of the silver and gold metals with the deep red of the garnets. I also like the coil and que designs of the wire work, it actually has a slight spring. Remember when wearing dangles don’t jerk your hand when something gets stuck – simple relax and put your hand forward into the spot it is stuck and most likely it will release. 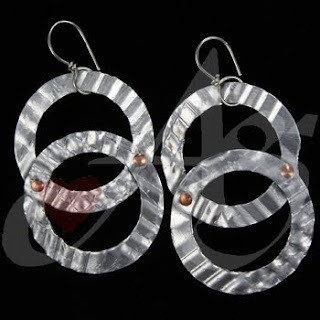 Wearing dangles takes some practice… trust me I know! This piece is available. I posted on Saturday since I missed Monday!! Sorry about that! 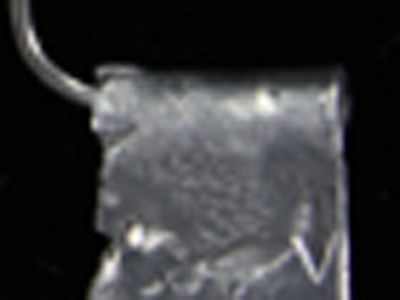 Here is another peak - can you tell? 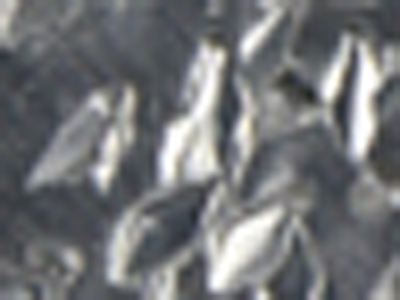 Maybe guess the metal? October is the month of the Rosary! Today’s piece: A sterling silver and copper hand wired rosary bracelet accented with beautiful pearls and hematite stones. I had great fun figuring out how to execute this piece. I love oval jump rings and I could see how it could ‘house’ a stone or two. 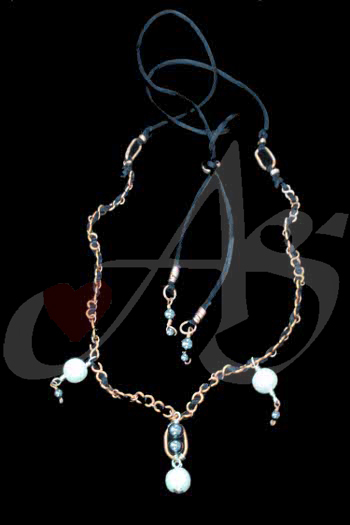 I love the dangle on this rosary bracelet, again very settle yet powerful when asked about the design. This piece also has a very cool necklace to compliment it. 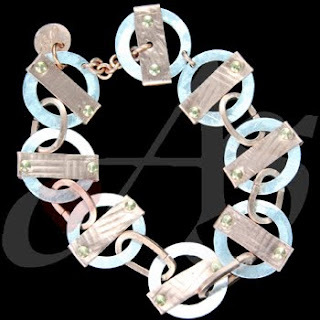 The color play between the stones and metals is fabulous! This piece is available. If you would like this piece, a similar piece, or any unique piece of jewelry; contact us! Don't forget to stop by our Facebook page, Google+ page, Twitter, Pinterest, or our website. On Agape Gift Facebook page I play a game GUESS THE GIFT - I wondered if you would like to see that game played on this blog post as well. 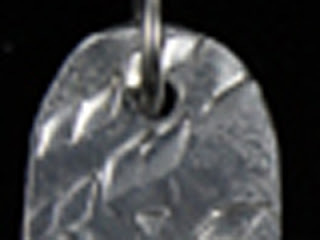 It is a sneak preview of the upcoming pieces for 2013. 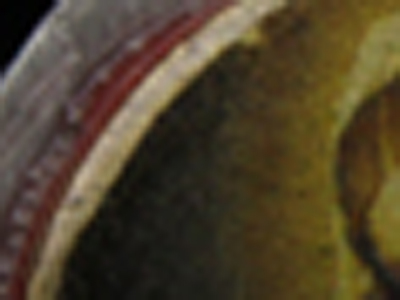 I will play a piece and you let me know if you like the challenge of guessing what it is! Just for fun. October is the month of the Rosary! Today’s piece: A Mother of Pearl rosary bracelet accented with vermeil, which my son designed. A regal classic piece with the beautiful pearl sheen and gold; reminding me of our elegant & noble Blessed Mother. A very comfortable flat design for the wrist – as always a great tool to speak of love. This piece is currently available. If you would like this piece, a similar piece, or any unique piece of jewelry; contact us! Don't forget to stop by our Facebook page, Google+ page, Twitter, Pinterest, or our website. October is the month of the Rosary! Today’s piece: A crystal rosary bracelet with a lot of symbolism, which my daughter designed. The black beads represent our sin; the red Jesus’s blood, the white the water to wash us clean; green giving us new life and the purple reminding us we belong to the royal King. A wonderful reminder of Jesus’s passionate love for us! This piece is currently available. 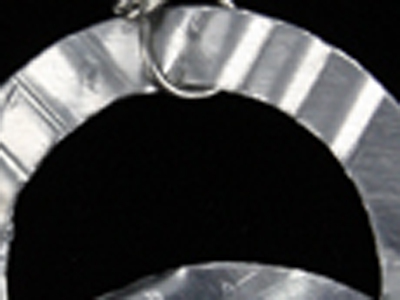 If you would like this piece, a similar piece, or any unique piece of jewelry; contact us! Don't forget to stop by our Facebook page, Google+ page, Twitter, Pinterest, or our website. October is the month of the Rosary! 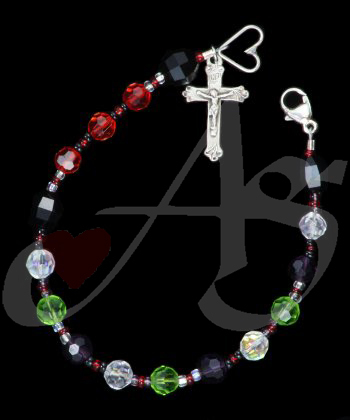 Today’s piece: A sterling silver wire & bead rosary bracelet with ruby Our Father beads. 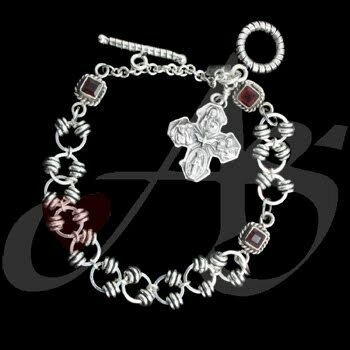 This rosary bracelet has a nice weight to it since it is all sterling silver, with signature movement of the beads inside the sterling silver jump rings. 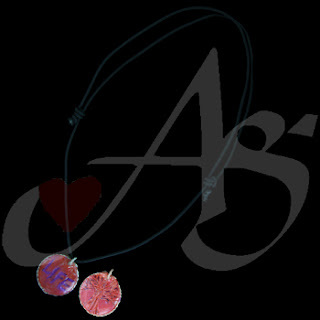 I love it when the design moves with the wearer and this one does just that! The bracelet itself has a very fluid movement within your fingers too. This piece is not currently available. If you would like this piece, a similar piece, or any unique piece of jewelry; contact us! Don't forget to stop by our Facebook page, Google+ page, Twitter, Pinterest, or our website. October is the month of the Rosary! Today’s piece: A copper and sterling silver wire rosary bracelet, designed by my daughter celebrating the fall colors. The bracelet makes music with dancing crystals reflecting the color of fall time leaves; wonderful piece of artwork enjoying the crisp changing of the seasons. This piece is currently available. If you would like this piece, a similar piece, or any unique piece of jewelry; contact us! Don't forget to stop by our Facebook page, Google+ page, Twitter, Pinterest, or our website. October is the month of the Rosary! 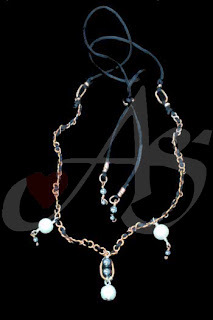 Today’s piece: A copper wire rosary bracelet with cream and blue fiberglass beads. 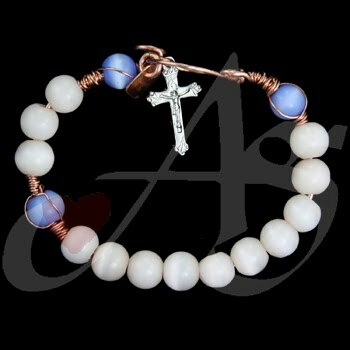 I love the softness of color in this bracelet, reminding me of Mary’s soft and kind heart to all of us. I can almost feel her caressing finger on my cheek when I see this piece. This piece is currently not available. If you would like this piece, a similar piece, or any unique piece of jewelry; contact us! Don't forget to stop by our Facebook page, Google+ page, Twitter, Pinterest, or our website. October is the month of the Rosary! Today’s piece: A full copper metal & wire rosary bracelet. This bracelet is a mix turquoise and blue opals with copper wire work. 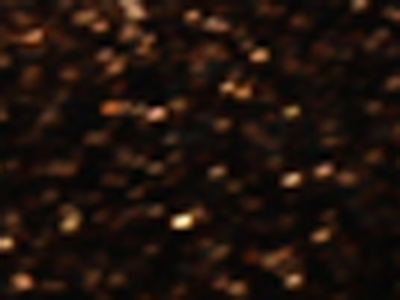 The copper metal rectangles are the Our Father with five decades of stones thus wearing your faith on your wrist. 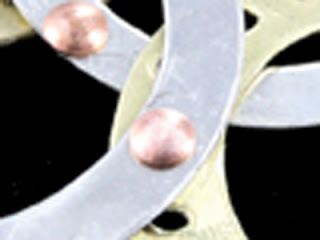 This piece also has a safety clasp as an insurance to the magnetic clasp. This bracelet feels good and looks great! This piece is currently not available. If you would like this piece, a similar piece, or any unique piece of jewelry; contact us! Don't forget to stop by our Facebook page, Google+ page, Twitter, Pinterest, or our website. Today’s piece: A rosary bracelet for confirmation. This bracelet is a mix of sterling silver and stainless steel, with rose quartz, peridot and pearls. The Our Father images reflect the candidate’s confirmation Saint and special memories of the day. Great way to cherish a sacrament and honor Mary with rosary prayers; thus wearing your faith on your sleeve (or wrist). Great evangelizing opportunity This piece is currently not available. If you would like this piece, a similar piece, or any unique piece of jewelry; contact us! Don't forget to stop by our Facebook page, Google+ page, Twitter, Pinterest, or our website. WELCOME OCTOBER!!! Beautiful fall time with the burst of colored leaves and the crisp cool air! Love it! 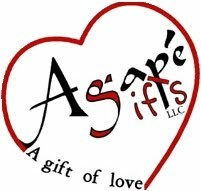 October also notes the official anniversary of Agape Gifts... we will be entering into our tenth year of service! What a blessing! I have great ideas to post but time doesn't always work in my favor so I ask for patience - the ideas are coming. 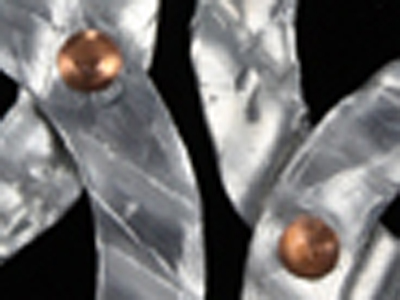 I am hoping to show case pieces of work from the past ten years, close to designing/creating order. Should be an interesting view of the developed ideas and execution techinques. 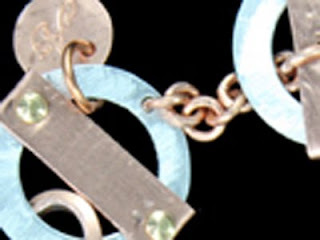 Also October is 'guess the piece' game in prepping for the BIG NOVEMBER show debuting a newly created line. Lots is happening and coming so stay tuned... also "Guess the Piece" is only to our Ag Facebook subscribers - so be sure to LIKE Agape Gifts facebook page to play! If you would like any unique piece of jewelry; contact us! Don't forget to stop by our Facebook page, Google+ page, Twitter, Pinterest, or our website.